Reported by Sripad Bhakti Pavan Janardan Maharaj currently staying with His Divine Grace at our Dum Dum Park Temple, Kolkata. Today is the Divine Disappearance day of Srila Haridas Thakur, and early in the morning, after Mangal Arati in Dum Dum Park in Kolkata, Srila Govinda Maharaj spoke of Srila Haridas Thakur's divine glories. The following are several of the themes His Divine Grace discussed. Srila Haridas Thakur was an exemplary devotee who always preached by his words, his actions, and his mind. Even before the appearance of Sri Chaitanya Mahaprabhu he was already known as a dedicated devotee and preacher, and after the appearance of Sri Chaitanya Mahaprabhu he dedicated himself to Mahaprabhu one hundred percent. Srila Haridas Thakur was an intimate friend of Sri Adwaita Acharya and Srivas Thakur. When Sri Chaitanya Mahaprabhu appeared, Srila Haridas Thakur could understand than an incarnation of the Lord had come because so many people were enlivened and chanting the Holy Names of the Lord. After Mahaprabhu took sannyas, Srila Haridas Thakur told the Lord that it was impossible for him to continue living in Nabadwip and that his desire was to be with Mahaprabhu in Puri. In Puri, Sri Chaitanya Mahaprabhu asked Kasi Misra for some place with a simple thatched hut, where there is a garden, and that place is known as Siddha Bakul. Kasi Misra replied that everything is for the satisfaction of the Lord Himself, and that Mahaprabhu did not have to ask, that he could have any place he desired. So Haridas Thakur was given that place, that garden house, in Siddha Bakul. The Lord stayed in the Gambhir and daily he would go to visit Srila Haridas Thakur on his way to the ocean, where he would bathe at midday. The society at that time was very strongly opposed to accepting anyone who was a mleccha, and Hinduism was very strong. Of course we are not Hindus, or Christians, or Muslims, or any of those things - but Vaisnavas. Srila Govinda Maharaj explained that everyone is coming from Vishnu, therefore all are Vaisnavas. "I do not know how much nectar the two syllables 'Krish-na' have produced. When the Holy Name of Krishna is chanted, it appears to dance within the mouth. We then desire many, many mouths. When that Name enters the holes of the ears, we desire many millions of ears. And when the Holy Name dances in the courtyard of the heart, it conquers the activities of the mind, and therefore all the senses become inert." Haridas Thakur commented that he had heard many verses glorifying the Holy Names but he had not heard any verse like this glorification given by Srila Rupa Goswami. Sri Chaitanya Mahaprabhu lived for twenty-four years in Puri. The first six years He extensively travelled, and the last twelve years He was absorbed completely tasting Radha-Krishna lila in the Gambhir. Haridas Thakur had a special ability that he could understand that soon the Lord would disappear and he commented that he did not want to see that final lila of the Lord. He asked the Lord to grant his desire: that he could leave this world before that final chapter of the Lord. In reply, Mahaprabhu assented, and said that Lord Krishna would satisfy Haridas Thakur's petition. The next day Sri Chaitanya Mahaprabhu came there with His devotees and began the chanting of the Holy Names - a kirtan that lasted more than two hours. Then Haridas Thakur took the lotus feet of the Lord upon his chest and began chanting, "Sri Krishna Chaitanya, Sri Krishna Chaitanya, Sri Krishna Chaitanya...."
He had dedicated his entire life to the chanting of Krishna's Name. His vow was to daily chant three lakhs (300,000) Names of the Lord, chanting the Mahamantra. But at the time of leaving this world, he chanted, "Sri Krishna Chaitanya," Mahaprabhu's Name, while looking at the lotus face of the Lord. Then Mahaprabhu began dancing while holding the body of Srila Haridas Thakur. After the soul passes away, the body must be washed with water, and Mahaprabhu took Haridas Thakur's body to the ocean. Then with His own hands, and with the help of the devotees, Mahaprabhu dug a hole near the shore and, after burying Haridas Thakur's body, a mound was made above the body for the samadhi. In this way the Lord was engaged personally and it was very miraculous. There, all the devotees had a big kirtan and then all went with the Lord to bathe in the sea. Afterwards, Sri Chaitanya Mahaprabhu went to the shopkeepers near the Jagannath Temple, held out his uttariya and begged Jagannath Prasad from them for the festival of Srila Haridas Thakur. They all wanted to give all their stock of prasadam to Mahaprabhu, but Swarup Damodar, who was so close to Sri Chaitanya Mahaprabhu, told the Lord that he would collect the offerings for the festival. In that way he collected a few palmfuls of each preparation from each of the shopkeepers and accumulated a large quantity which was then carried back for the festival. Kasi Misra also sent a large quantity of Jagannath Prasad for the Lord and all the devotees. When all the devotees were to take prasadam, the Lord wanted to serve them, but He wanted to give each person more than what five men could eat. Then Swarup Damodar told the Lord that unless He personally sat down to take prasad, no one would eat. The Lord was made to sit, and Swarup Damodar and others then served the devotees. 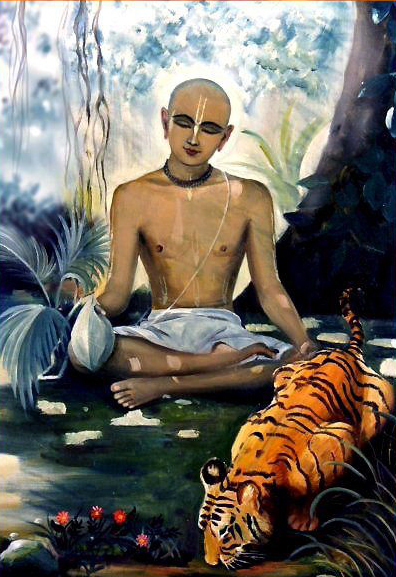 Today is the festival of the disappearance of Srila Haridas Thakur, and as Sri Chaitanya Charitamrita notes, Sri Chaitanya Mahaprabhu gave the boon that all those who participated in this festival, and those who will participate in the future festivals, all will receive eternal benefit and go back to Krishna.